The Mini Multi Function Expansion Board is a small device that provides 5 analog inputs and a 1-wire interface that can handle up to 64 temperature sensors. On demand, the device will learn the serial numbers of all devices present on the 1-wire bus. 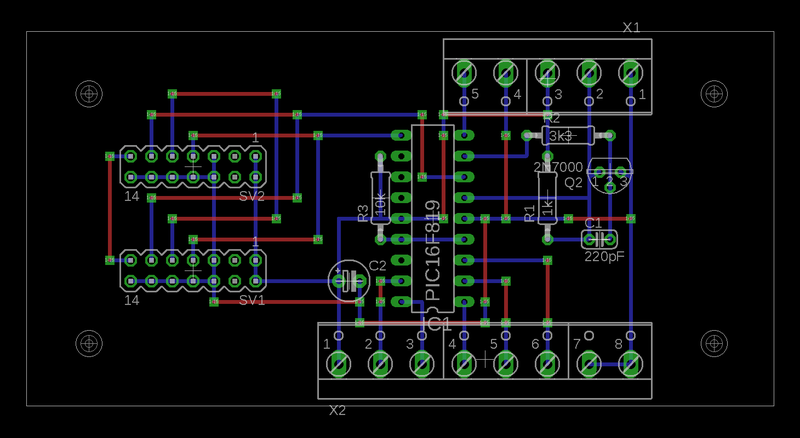 The board supports the DS1820, DS18S20, and DS18B20 temperature sensors. If the COUNTER symbol is defined when building the project, one of the analog inputs is instead configured to count pulses using an 8-bit counter with an optional 8-bit pre-scaler. 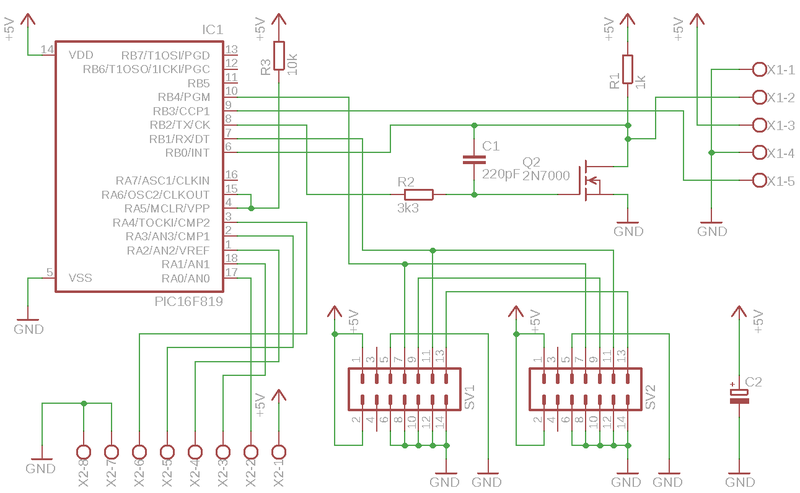 With a small modification of the circuitry (accompanied by the appropriate code changes) it is also possible to provide an input that can count pulses using a full 16-bit counter. One additional screw terminal, connected to another I/O pin of the PIC, has already been provided in the design. This connection may be used by the firmware as a method to put the device in self-program mode. Another option is to use it to accurately measure time intervals. For example to measure the time between pulses of an electricity meter. Based on the measured interval, the current power consumption can be calculated. 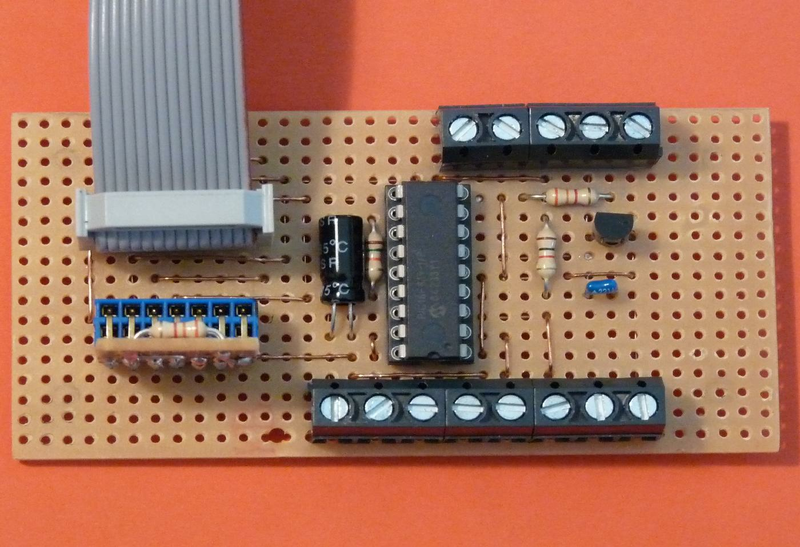 Click on the images below for the schematic and a proposed circuit board layout that can easily be built on a piece of perf board. Discover 1-wire devices. This operation takes a few milliseconds for each connected device. So allow some time before continuing to communicate with the device. Status flags. See below for the meaning of each individual flag. Number of discovered 1-wire devices. Pulse count. Reset to 0 after reading the value. A/D Value (last 3 bits select the A/D port). Temp sensor flags (last 3 bits select the group). Temperature (last 6 bits select the sensor). Sensor family code (last 6 bits select the sensor). This will report 16 (0x10) for DS1820 and DS18S20 devices and 40 (0x28) for DS18B20 devices. Analog input 0 has changed. Reset after reading the status flags. Analog input 1 has changed. Reset after reading the status flags. Analog input 2 has changed. Reset after reading the status flags. Analog input 3 has changed. Reset after reading the status flags. Analog input 4 has changed. Reset after reading the status flags. Temperature has changed. Reset after reading the status flags. Pulse count has changed. Reset after reading the pulse count. 1-Wire devices detected on the bus. The status byte allows very efficient access to the device by the Homevision controller. Your schedule would just regularly check the status byte. Only if the bit for any of the used analog inputs is set, it should write a byte selecting that input and reading the value. Similarly with the pulse count. When bit 5 is set, you can read the temperature sensor group flags to find which groups of 8 temperature sensors have detected a change. Next you read the temperature sensor flags for those groups to determine which sensors within the group have changed.